As much as we love getting gifts, giving gifts, and overall just enjoying everyone’s company, it can be a hassle to shop for those perfect presents. Whether it’s the immense crowds, the cold weather, the hunt for a popular item that’s always sold out, or the accumulation of all those purchases, it’s important to not lose touch of what makes this time of year special, and it’s easy to do so close to home at Alexan Arapahoe Square. 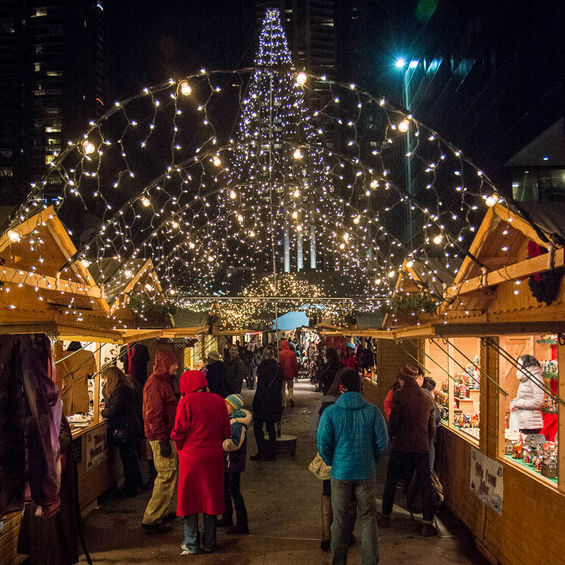 The Denver Christkindl Market is a seasonal market with German culture, an old-fashioned feel, and a devout love for Christmas time. It’s located only a mile away from our luxury apartments, meaning that you can drive there in under ten minutes or, if you want to cut back on gas expenses, you can take the Light Rail in under twenty. Open all the way to December 23rd, local vendors will sell artisan crafts that make the perfect gift for any household: find the ideal Christmas tree at Neighborhood Christmas Tree, decorate your home with hand crafted glass from Unique Glass Ornaments, and find beautiful artworks from Eastern Europe at Andrey’s Gifts from Afar. Get hungry during your visit? Try out one of the many international food vendors like Gaby’s German eatery and Chocoidea. Finally, enjoy live entertainment from musicians around the world, and warm yourself with a refreshing German beer or a sumptuous apple cider. Bring the fun back into your Christmas shopping routine at Alexan Arapahoe Square. Take a tour of our luxury apartments in Denver today, and explore the Christkindl Market before they close their doors for the season.